College SAVE's age-based options are ready-made portfolios that adjust based upon your child's age. That means, when your child is younger, your portfolio may include aggressive investments with a higher potential for growth as well as risk. As your child approaches college age, the portfolio adjusts to include more conservative investments designed to preserve your savings. The more conservative the portfolio, the higher its concentration of bonds and short-term investments. Regardless of the option you choose, Vanguard will automatically adjust your portfolio to include less-risky investments as your child ages. You could lose money by investing in a portfolio which includes the Vanguard Short-Term Reserves Account which in turn invests in the Vanguard Federal Money Market Fund. Although the money market fund in which your investment option invests (the “underlying fund”) seeks to preserve its value at $1.00 per share, the underlying fund cannot guarantee it will do so. An investment in this investment option is not insured or guaranteed by the Federal Deposit Insurance Corporation or any other government agency. The underlying fund’s sponsor has no legal obligation to provide financial support to the underlying fund, and you should not expect that the sponsor will provide financial support to the underlying fund at any time. 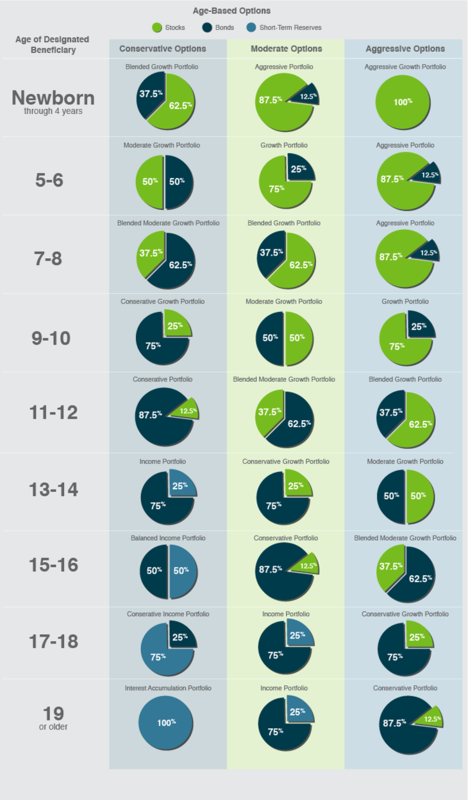 As you can see in the table above, the Conservative Age-Based Option has a higher concentration of assets in bonds or short-term investments than the Moderate Age-Based Option. These portfolios tend to be less volatile than those with higher stock allocations, so they may not decline as far when markets go down or appreciate in value as much when markets go up. If you need assistance understanding these investments or have any questions, call us at 1.866.SAVE.529.